Mealtime is a multisensory experience. Most of us take sitting down to a meal for granted, whether we are sharing a meal or celebrating special occasions around the table, and there are whole holidays are designed around the communal experience of consuming food. That our body is participating in a marathon – simultaneously integrating and manipulating sensory input all through our meal, is often not on our radar. You might remember occasions where you shook your body because the sour taste surprised you, or the chip was too loud on a headache day, and what about the food filled table with barely space to put your own plate? Those all are sensory experiences. A lot of children, having those experiences all at the same time, have a difficult time filtering out information. Let’s take a closer look at the specific sensory properties that influence our mealtimes to better understand how multisensory input might be influencing the mealtime experience of children. Visual: We’ve all been served that casserole. That one that sported a long list of wonderful ingredients on the menu, only to arrive at the table – a nondescript blob, covered in sauce. Presentation should not be underrated. The same is true for children. Think about color combinations, the shape and size of the food, as well as the plate you are serving it on. It can be overwhelming. Many children, for instance, find it difficult to eat a meal in which the individual pieces are not identifiable, but rather combined into a mash. Tactile: The feel of our food can really influence our experience of eating it. Our skin is contains numerous nerve endings, transmitting the sensation of what is touching us to the brain. Children may squeeze, pinch and smear the food, experiencing its tactile properties before they will allow it to get into their mouth. Learning to tolerate sticky or other textures on their hands is a great first step to tolerating them in their mouth. Smell: Mmm, fresh baked cookies or bread, strawberries, fresh grilled veggies… Our olfactory system is very closely linked with memories and emotions. Children have to build those associations and require multiple experiences with new foods to do so. And, these associations work in both positive and negative directions, which is important to keep in mind when you are cooking. The smell of food can linger in the house long after mealtime is over. This can be a pleasant experience, but to those who are sensitive, these smells can turn off the appetite for the next meal. The smell of food can even remain on the cook’s hands! And, don’t forget the powerful connection between smell and taste. Hearing: Having a meal in a crowded restaurant, with music playing and people yelling or having conversations can make eating difficult for any of us. For some children, it can make it downright impossible! And, the sensation of hearing goes beyond the external environment, including the experience of the sound food makes as you eat it. Charles Spence, head of the Crossmodal Research Laboratory at Oxford University’s Department of Experimental Psychology, investigated the influence of sound on our food experiences. This so called “sonic seasoning” can influence our dining experience right down to the way to we taste flavors. Even background noise can influence our taste experience, and Spence thinks this might be the reason the tomato juice is one of the most frequently ordered drinks on airplanes. If your child has eating and feeding issues, altering their sound environment is an often overlooked way to help the situation. Taste: When it comes to food, there is no denying that taste matters. The sense of taste itself is a multimodel experience, heavy influenced by receptors in the nose. Researchers have identified 5 different tastes: sweet, sour, salty, bitter and unami (savory/ meaty tastes), and they have found that even very young infant’s facial expressions and behavior reveal an experience of taste. When different flavors of foods were placed on an infant’s tongue they responded with a smile-like expression for sweet tastes, a protrusion of lips for sour, or with gagging or vomiting for bitter tastes. One should also keep in mind that one taste can influence how we experience the next taste. A sour beverage is a lot more intense after a sweet piece of pie. And, again, there is the connection between taste and smell and memory. Children with a history of reflux, for instance, might refuse milk or formula because the taste and/or smell might remind them of the vomiting experience. Two senses that often don’t get invited to conversations about mealtime are proprioception and the vestibular system. Nevertheless, they are quite important and impact our experience in ways we might not ordinarily fully appreciate. Proprioception refers to the sense of where you are in the world, your awareness of your body position and the things around you. The vestibular system is responsible for balance and also affects eye coordination. So how are these systems impacting eating? Proprioception: Have you every thought about how your fork knows where the mouth is and doesn’t end up in your cheek? Proprioception helps you navigate your body through space. It helps you know how far you have to reach to get that glass of milk, how you have to bend your wrist to drink it, and how to place it on the table without spilling it. Proprioception is also the awareness of where food is in your mouth through nerves in your cheeks, tongue and even teeth! If this system is not developed enough or working properly, food can get lost in the mouth and children have a difficult time detecting where it went, which is often a stressful experience for the child. Luckily, this system can be “exercised” and altered by offering children foods that provide a lot of proprioceptive input. Some examples of these might be chewy foods, sour foods, or crunchy foods. Vestibular System (Balance): We often refer to mealtime with a toddler as a balancing act. Well, it is 0 and not just metaphorically. Sitting up in a chair with no support is tiring and children are a lot less likely to engage in food exploration or eating without the right support. In order to perform tasks such as chewing, we need to have a stable base, much like when we engage in fine motor tasks such as writing or drawing. If we wobble on our chair, our letters will be illegible, and if we are wobbling at the table, eating will be very tiring or even impossible. If we asked most adults to sit on a wobbly bar chair and have a 5 course meal, we would likely find their feet wrapped around the legs of the chair in an attempt to gain a sense of stability. Even then, they might not make it through the meal. This is no less true for children. Provide them with proper seating arrangements where their trunk is supported and feet are grounded on the floor, a foot rest, a chair, or a duck taped pile of old phone books or catalogues. This will impact their attention during meals as well as their ability to chew and swallow foods safely. 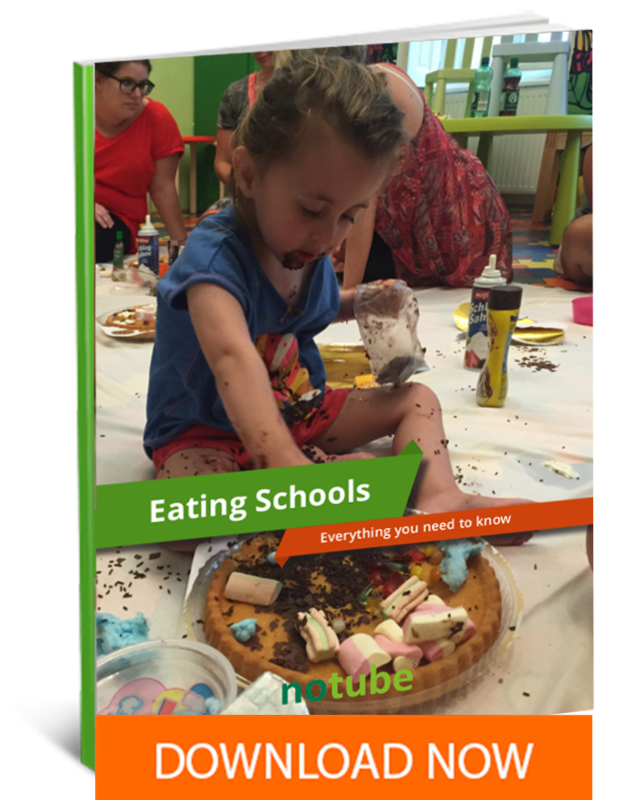 Here are some closing food for thoughts: Provide children with ample experiences where they can use all of their senses to meet and explore new foods. Put the washcloth away, and let them use their hands to feel the food. Bring children into the kitchen to be part of the creation of meals. Explore the multitude of colors and how they change when food is cooked. Make sure their bodies are supported so they don’t have hard to sit up and they can spend all their energy on exploring food with all their senses.